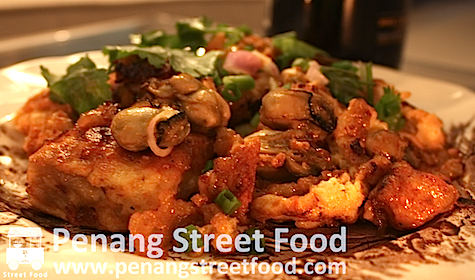 pharmacy online canadian pharmacy Oh Chien | Penang Street Food | Penang Delicacies "penang food", "penang hawker food", "penang street food", "penang delicacies", "penang gourmet", "food in penang"
Oh Chien is essentially a Chinese oyster omelete. The additional ingredient to the omelette is tapioca flour which lends a sticky and slightly gooey texture to the dish. The watery tapioca flour batter is ladled into a hot wok and is flash fried before the eggs are added into the mixture. Meanwhile, small oysters are stir-fried with garlic, chilli paste and shallots, before they are combined with the eggs. The omelete is fried until becomes golden brown and fragrant. While crispy on the edges, the omelette is soft, fluffy and starchy on the inside. The tangy chilli sauce which has a dollop of minced garlic that accompanies Oh Chien gives the dish a flavourful zing. Occasionally, some hawkers use lard to fry the Oh Chien for greater flavor and aroma. This dish is should certainly be eaten in moderation for those watching out for their cholesterol! Expect to pay around RM6.00 for a small serving of Oh Chien.